See those jars of jam up there? I made them. Some of you may think that I am trying to be Martha Stewart with a feature on canning. Nothing could be farther from the truth - she is way too perfect for me (except for that stint in the pokie). No, I found time to make jam because I was able to produce strawberry jam with almost no sugar added. My entire half pint jar of jam is a whopping 78 calories and it includes 150% of your daily value of vitamin C.
Ball sent me something called a “Canning Discovery Kit” and they included something called “Low or No-Sugar Needed Pectin”. Pectin is a compound found in the cell walls of plants and is a jelling ingredient. Most recipes for jam include a lot of sugar, so this no-sugar needed pectin is amazing stuff. 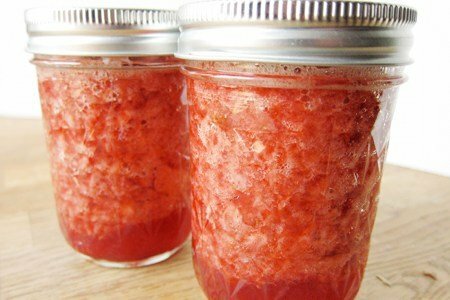 To make my jam, I simply crushed fresh strawberries, added pectin, a wee bit of sugar, and water, boiled and stirred for a minute and (here comes the hard part) jarred my product. If you don’t want to jar your jam, just put in a container and store it in the fridge. It should stay good for a week. For those of you who want to give it a try, there is a clear explanation here: It’s Easy To Can. You have to use a stockpot to heat your jars to boiling hot, then you fill your up to ¼ inch from the top of the jars with hot jam, then heat up the jars in boiling water again for 10 minutes until the lids seal. It isn’t that difficult, but it does take attention and time to complete it. I used a tool called a "Jar Lifter" to help me handle the hot jars. My jam came out tasting of fresh strawberries, and I am finding that my sugary Bonne Maman jam no longer tastes good to me. Also, my jam costs about ½ as much as a jar of premium supermarket jam. The jars will stay good for a whole year and I found that it makes your neighbors smile when you hand them your preserves. Wash, stem, and crush strawberries. Taste the strawberries for sweetness and add sugar if needed. Combine strawberries, water, and pectin in a large saucepan, stirring to dissolve pectin. Bring to a boil, stirring constantly. If gel starts to form before 1 minute boil is complete, remove from heat. 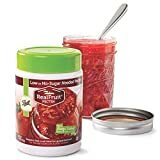 Ladle hot jam into hot jars, leaving ¼ inch space below lid. Remove air bubbles by stirring with a metal spatula. Put on lids and process 10 minutes in boiling water. How about using frozen bags of fruit? Any luck with that? Could make it all year long. Also, my aunt used to make a grape jam with nuts that was wonderful. It would have been one of those quickie kinds, that was just her. Is anyone famist with that receipe? She made this frozen strawberry jam all the time. Yummy! i researched the new no sugar pectin and i figured to find some kind of artificial sweetener in it but low and behold there isn't any. now i have to get some to try. LOL!!!! the thing i like about your blog is that you don't use artificial sweeteners and that's important to me because they upset my tummy. there is another blog out there called hungry girl and she's always putting artificial sweeteners in everything. oh, and I'm buying your book this week.you have so many good down too earth recipes. Can you just freeze the jam rather than doing the hot bath thing? This is great! I love to make our own jam/jelly and never put in the amount of sugar that's called for in the recipe. Can't wait to try this out! @Judy - thanks for buying the book -I hope you love it!! Great recipe! Has anyone tried agave instead of sugar! I would love to know how it turned out. To seal the jars more easily, pour the hot jam in the jars, twist close the tops but leave only slightly loose. Then turn the jars upside down. As they cool, a little air comes out and a small area of vacuum (space) is created at top of inverted jar. After they cool, turn right side up. You will hear little 'clink' sounds as the tops vacuum seal. This saves you from heating a second time. Do you think this recipe would work for guavas? Thanks for sharing this, I've been wanting to try my hand at canning so I may give this a go! There is a freezer jam recipe on the insert of the Sure Jell Low or No Sugar box. It is delicious because the strawberries are not cooked. I freeze it in small containers because I'm the only one eating it. Now that it is strawberry season, looking up this old recipe! I found some Certo Premium Liquid Fruit Pectin in the back of my cupboard. Do you think I could use that instead of Lo or No Sugar Pectin just as well? ?